This statement by one participant in my 2015 research in clergy review did not refer to attacks from critics in the wider community, but to ‘friendly fire’ from within the church, in this case with “verbal attacks from elders and their wives.” The report accords with anecdotal evidence I have seen and heard over 40 years in parish ministry. Verbal abuse, undermining, nasty letters, lies, and unjust critique without right of reply often lead downhearted pastors to shrug their shoulders and say “this is church”. But there are times when what is occurring is unreasonable, repeated and unsafe. Those are the defining criteria for workplace bullying. What? Parishioners and colleagues are called to be respectful, kind and loving even when they are exercising accountability. Paul calls it speaking the truth in love. The NZ Presbyterian Code of Ethics requires ministers to “deal truthfully with people, encouraging free and open discussion, upholding their best interests, rights and well-being…. (and) recognising the dignity and worth of every person” But unless the local church has subscribed to this code, (which is not mandatory, only strongly encouraged, for lay leaders) there is no way to require that respect from the members of the congregation. Bullying is endemic in some workplaces – health, education, hospitality and public service. Recent studies in New Zealand reveal bullying was experienced by 17% of workers in key service industries, 43% of public servants, and 90% of nursing students on placement. These sectors often include strong hierarchies and workplace politics, but in Presbyterian and Baptist churches – the subjects of my thesis – hierarchies are flat, and politics goes against the grain. Nevertheless, power plays are common in churches, and it is usually the pastor who feels the brunt. Members often dispense unsolicited advice about a minister’s personal life, the way they dress, their use of language, their kids’ behaviour, their personality, and the cost of their house or car. They feel they own the manse family - and this entitlement can at times lead to unreasonable and aggressive demands. So what to do? In this post I will focus on the specific area of bullying, rather than wider issues of discrimination, violence and sexual abuse/exploitation. A helpful resource in my learning about this has been the paper released by Worksafe New Zealand Preventing and Responding to Workplace Bullying (2014). New Zealand’s new health and safety regulations require workplaces – including churches – to put policies in place to protect workers and manage the hazards inherent in a bullying culture. If any one of these behaviours is repeated and unreasonable, it is likely to have an effect on the target’s health and safety. Low self-esteem, anxiety, fatigue, irritability, weeping, insomnia and substance abuse may develop. Sometime people find they don’t want to go to work, or they dread opening their email. Sometimes feelings of trepidation get so bad they leave work precipitately. These are warning signs, that should be noted in oneself or others. No wonder Worksafe wants to ensure bullying is prevented. But remember what bullying isn’t. It is not one-off rudeness or forgetting, requiring high standards be met, giving constructive feedback or correction, or demanding compliance with ethical codes. 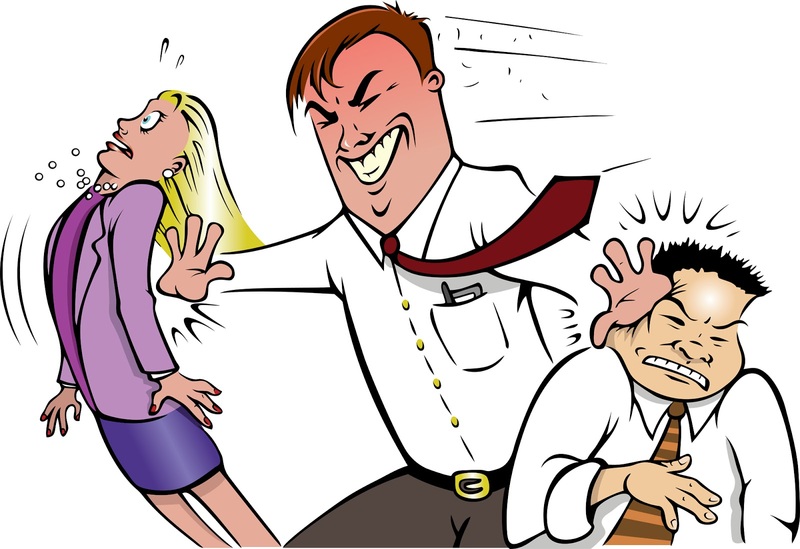 Even a one-off incident of unreasonable behaviour, eg making a fist at a colleague, is not bullying, though it could still lead to disciplinary action. There is a fine line between management and bullying; context and temperament play into it. But sometimes the line is stepped over, repeatedly, causing stress, ill-health and, in OSH language, a workplace hazard. What to do? Once it is seen that there is an issue that may constitute bullying of you or another person, document instances with dates, times and witnesses. Keep copies of emails, including your responses. Don’t use the term 'bullying' until you have talked it over with an advisor like a pastoral supervisor or HR manager; the outside perspective can help you see if the behaviour is indeed unreasonable. Naming your boss a bully because they called you out on a missed deadline or inadequate report is only going to inflame the situation. In a church leadership context, check with a trusted lay leader as to whether the person attacking or undermining you has any role in keeping you accountable. If they don’t – or if they do but are acting unreasonably – ask that colleague to help you challenge the behaviour using assertive, not aggressive, language. I don’t advise applying the Matthew 18 pattern if you already feel unsafe; it is a high-stakes judicial process for church leaders contemplating excommunication for serious sin. Low key strategies based on 'speaking the truth in love' are preferable, though there are circumstances where formal action may be needed. Most churches have discipline protocols in their constitution, even if they are rarely used. Perhaps the new regime of Health and Safety legislation in NZ will mean these provisions must be enjoined more to protect clergy and congregations from emotional harm. A skilled pastoral supervisor can help, or find help for you. They can help you distance yourself from the situation and get a clearer perspective. They can assure that it is not unchristian to confront unreasonable behaviour. They can ensure a bully does not take away your power or your joy, by pointing you to Christ’s unending supply of abundant life, hope and courage. But they will also help you see that you are not alone in this experience. Friendly fire comes with the territory. Spiritual bullies impose their tastes, make unreasonable demands or write vicious letters or emails that can never be 'unseen'. They employ ridicule, manipulation and deception, and are selective in their approach to Scripture, ignoring Christ's commands to love, in pursuit of power. Some psychologists and authors describe narcissistic crazymakers, whose outward charm and compassion hides a cruel and destructive ego. Most of us can name at least one of these in our church! Yes, criticism comes with the territory for pastoral leaders, but undeserved or covert attacks can be seriously demoralising for pastors who love God, love people, and have sacrificed in order to serve in ministry. We, of all people, know that the church is made up of beloved but frail humanity, where every member is “an odd combination of self-sacrificing saint and self-serving sinner.” Unlike other organisations, the church doesn’t have the luxury of choosing its members. “Within the gathering of professed believers,” says Marshall Shelley in a book about Well-Intentioned Dragons, “there is a full range of saint/sinner combinations”. Ministers are committed to care for all members of the body, even those well-intentioned but subtly dangerous folk who take up the role of bully in the church family. To think about: How and when have you felt bullied? Would you respond differently today? Is there any time when you are tempted to use bullying behaviours yourself?